You are planning a wedding and you are on the stage of choosing the wedding flowers? Regardless the fact whether you are looking for the trendy flowers arrangements with the contemporary touch or flowers styled in the classical way with the romantic touch, the beautiful flower arrangements can really vivify and beautify the general atmosphere during your big day. 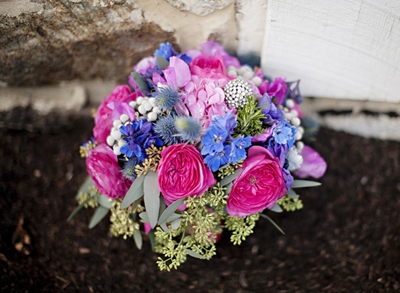 Besides, flowers became an inalienable part of any wedding celebration. We have prepared the latest trends in wedding flowers especially for you. Contemporary trends are very versatile, so you will easily find the wedding flowers that will suit your personal taste and overall wedding color theme. 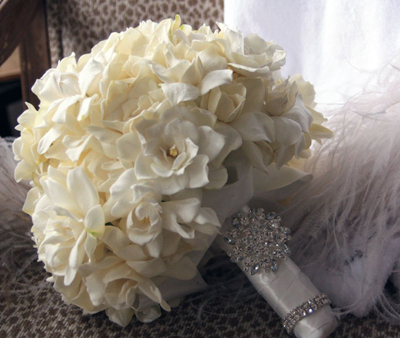 Sure, it might sound extraordinary and vulgar at the beginning, but adding just a bit of feather or fur will not only make your bouquet look beautiful, but also add the touch of extravagance to it. 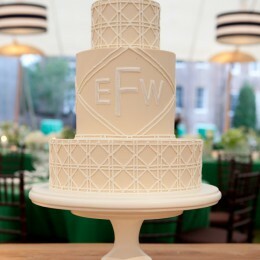 As a rule brides are always the center of attention and that’s natural. One more way to keep everybody’s eyes on you is opting for the larger bouquet in hues that would stand out the main color scheme. For instance, in case the main wedding colors are white and red, a bouquet made from the bright blue hydrangeas or eye-catching yellow lilies will definitely make you the focus of guests’ gaze. But remember, you don’t want to stand out too radically, so set the common ingredient in your bouquet like long green stems or red accents. If you look for something original, you may go for the single large flower such as a sunflower or a daisy. This will look not only elegant, but also original and memorable. 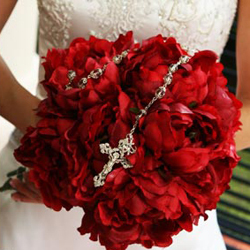 Bejeweling the wedding bouquet is an ideal way to glam it up, regardless the shape or the bouquet and the flowers type. 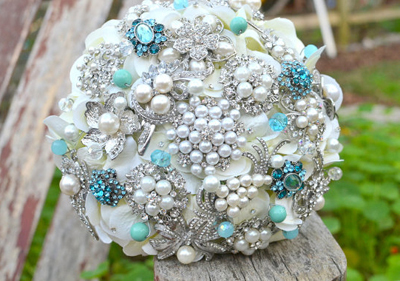 By the bejeweled bouquet we don’t means the wedding bouquet with rhinestone encrusting. 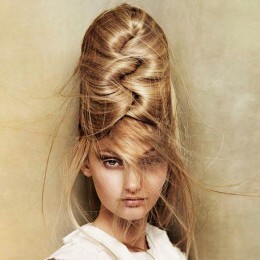 Simply add the pearl-tipped pins or the inexpensive jewelry for the elegant look. Also you may attach the brooch made from the faux diamonds to the bouquet wrapping. 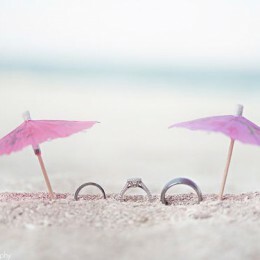 Besides, you may find the jewels that would suit the color scheme of your wedding. 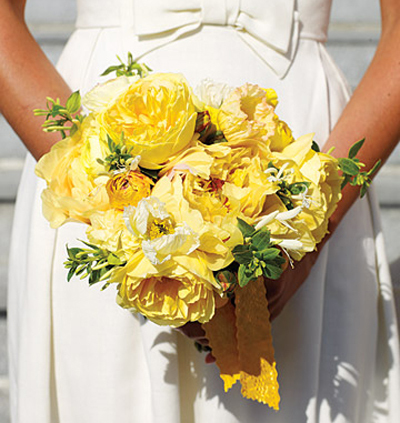 The golden rule is not overloading the bouquet with embellishment so that it doesn’t look tasteless. Keep in mind that more is not always the synonymous of better. While other brides tend to opt for the luxurious flower arrangements, you may opt for the simple bouquets in the classic style placed in the vessels. It will look great along with the rough linen tablecloth. If you want the flower arrangement to look original and eye-catching, you might go fruity. Yes, yes, it means placing the real fruit in your flower arrangements and you are guaranteed the higher interest of publics. Moreover, some fruits could perfectly fit and complement other flowers. You may not even use the entire fruit. For instance, the sliced citrus drifting in the clear vase filled with flowers will definitely surprise everybody. 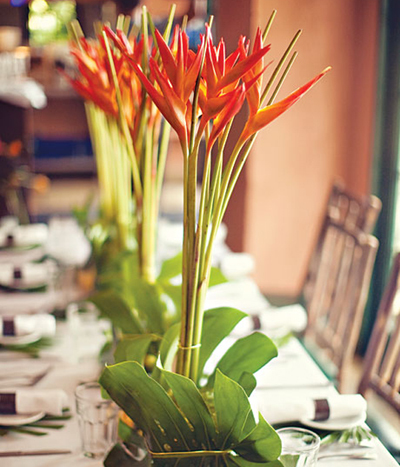 Asian-inspired flower arrangements are just like the Asian cuisine. It unites the elements from both Japanese and Chinese cultures and customs. The asian-inspired fusion style could be used by brides who look for style and uniqueness. 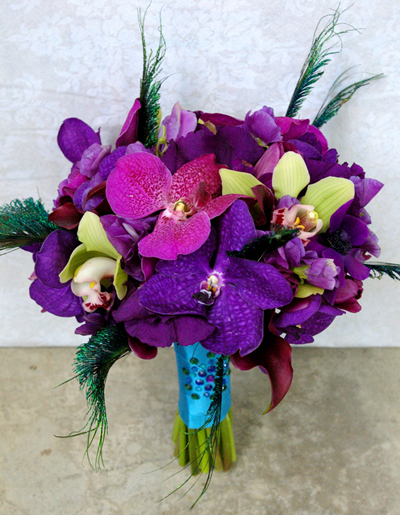 Usually Asian fusion arrangements contain cherry blossoms, orchids and bamboo stalks. 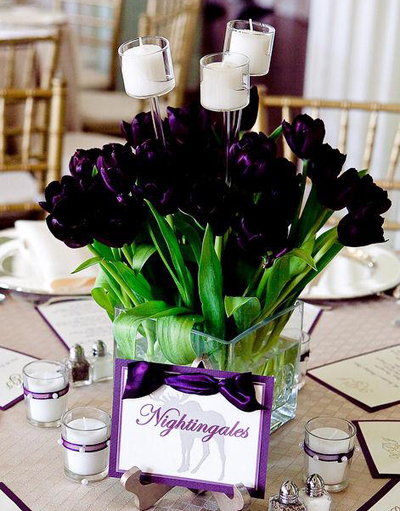 Making the candles the part of flower arrangements is the contemporary way of adding the illumination effect. The days of simple placing the taper candles on the tables are gone. Nowadays brides tend to experiment by have them hanging from the tree branches and hanging plants or by placing them in the centerpieces. Candles as the part of the flower arrangements can perfectly illuminate the flowers and create the awaited atmosphere of romance. The only thing is being careful with the open flame. If the family heritage is not an empty phrase for you, one way of paying attribute to your roots is incorporating some family items in your flower arrangements. It could be any subject starting from the pieces of grandmother’s china to mother’s pearls. There is no doubt that flowers look stunning, but they are not that environmentally friendly. 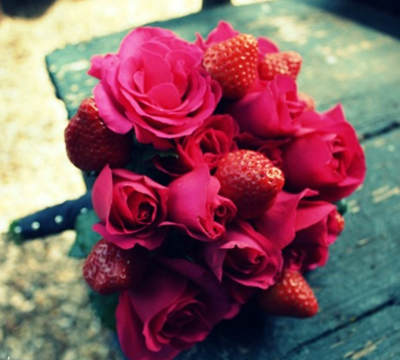 Usually, these beautiful blooms you get on your wedding reception are coated in pesticides and other unsafe chemicals. So, some environmentally anxious brides either order the local organic flowers or simply refuse using flowers. 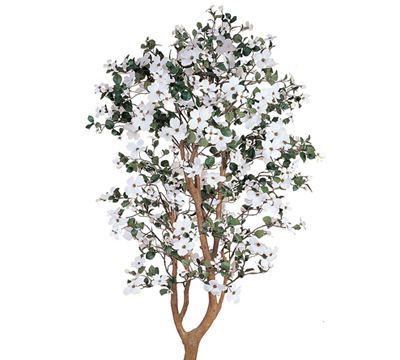 The modern alternative to the flowers is trees like ivy plants, vines, bamboo, spiral bay and topiary trees. 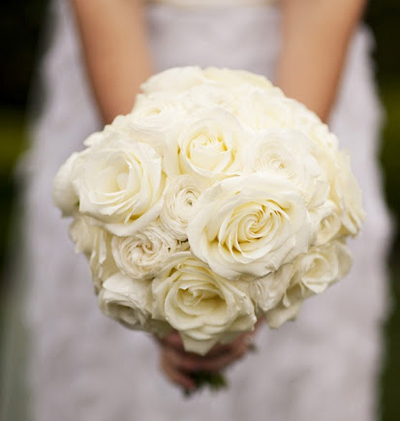 You may also choose from the wide-leaves plants like magnolia, maple and hosta for composing the bouquet. They could be perfectly embellished using feathers, jewelry, fax fur and other elements.